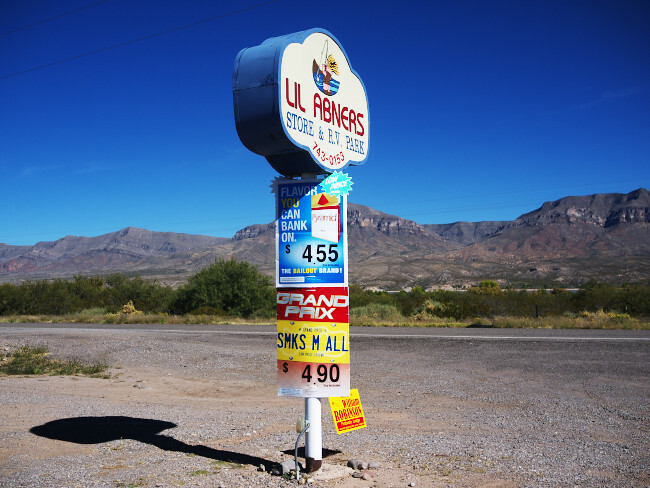 It was a sudden, unplanned Sunday afternoon road trip, down through the heart of New Mexico, paralleling the Rio Grande, to the southern part of the state, to meet up with an old friend. He gave me driving directions, informing me of which exit off the interstate to take. Knowing that exits are numbered by their mile marker, and knowing that mile markers on I-25 begin at the state's southern border with Texas, I knew we'd be on the road for a few hours, at least. Driving on I-25 south of Albuquerque, one passes a hodge-podge of industrial scrap yards, auto-salvage yards, farm fields both fallow and fertile, sand dunes weed-strewn and marked by the scars of countless off-road vehicles, and billboards like cinema screens, advertising some local radio station or gambling casino or, by its blank marquee, a sign of the economic times. 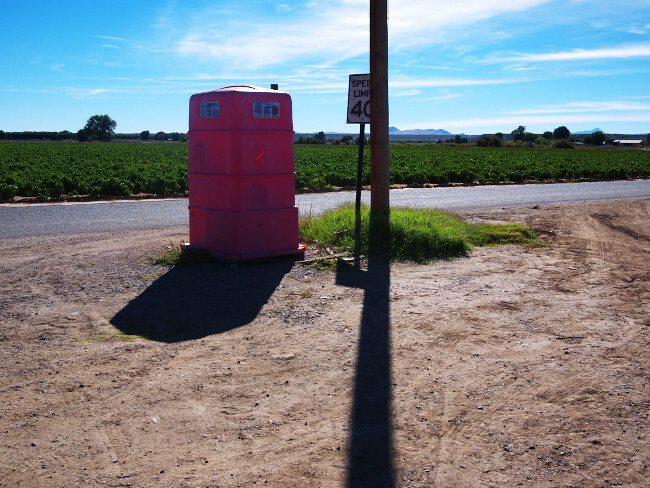 The clutter and detritus of a marginalized economy soon pass as we follow the ancient path of Spanish Conquistadors, past fields irrigated by the Rio Grande's precious waters, threading its way through badlands and deserts and mesas, a geological windfall. We pass a newly planted grove of pecan trees, on the site of a former vineyard, abutting the narrow strip of clay and sand between the highway and the high bluffs to the west. 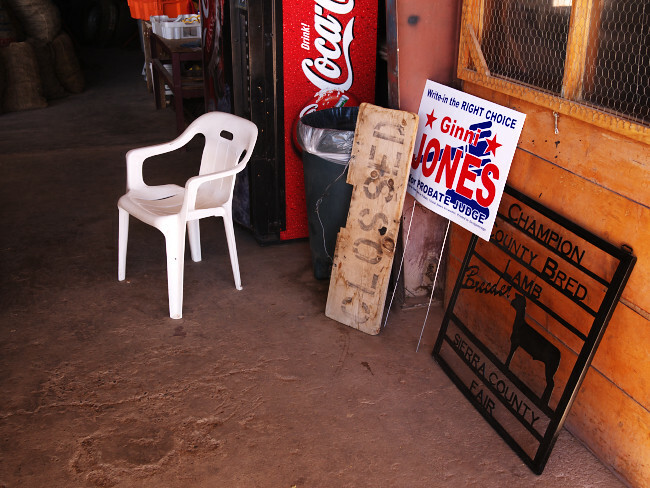 The former winery's weather-beaten building still sports a real estate sign. One wonders whether the real estate company has fared any better than the winery, in these tough economic times. I am reminded that, despite the seeming impoverishment of my home state (comparing how other states perform against each other, we seem to hover near dead-last in almost every metric imaginable), there seems to be some underlying toughness, born perhaps of centuries of tradition and the appeal of the frontier west; despite hosting the high-technology centers of Los Alamos and Sandia National laboratories, and Intel's largest semiconductor factory, there seems to remain some underlying frontier wildness to the place that refuses to be tamed, except that one remain in close proximity to the land. Soon the highway meanders apart from the river valley, which is now miles distant to the east. Columns of smoke rise intermittently from farmer's fields being burned after the harvest, being readied for winter's arrival. In the far distance mountain ranges loom, one after the other, more like dreams than reality, dreams of lands distant and vast. Reality harsh and cruel is never far from view in New Mexico. Whereas in many parts of the midwest, like in central Texas, myriads of small towns hide the harshness of life behind a facade of clean, neat and orderly, the small towns of New Mexico are testaments to failed dreams, the scars of brokenness clearly evident by the clutter of rusted cars and broken out-buildings, overgrown and in seeming disuse. What comes to mind is the term "badlands," of which Marty Robbins' famous song is a more gently reminder. We stop in Socorro, at the Manzaneras Coffee House, for a latte and scone to go, and soon we're back on the road, winding our way south, past the little village of San Antonio, with its famous Owl Cafe (although we prefer the Buckhorn, across the street) and the nearby Bosque del Apache National Wildlife Refuge, and in the far distance the desert where, fifty five years ago, a nuclear explosive was tested at a place called Trinity. We pass abandoned cars along the side of the highway, while miles to the east the Rio Grande pools and collects into that lengthy recreational lake called Elephant Butte. We soon find our exit, and a mile or so later we pull up into a humble RV park along a two-lane highway. Our friend Bob meets us at the entrance, and within minutes the quietness and peacefulness of the place begins to settle the dust from the road, our minds and spirits relaxing once again. Driving the nation's interstate highways can seem more like combat these days than genteel motoring. Bob shows us the little convenience store adjacent to the RV park, with their well-supplied stock of fish bait in the back room. We are soon on the road again, this time Bob is driving, heading down through the farmlands of the Hatch valley, past centuries-old fields of chiles, corn and alfalfa. The harvest is well underway, the tin roofs of sheds covered in bright red mats of chiles being sun-dried, and the fields still full of chile plants, their green foliage dotted with bright red pods ripe for harvest. 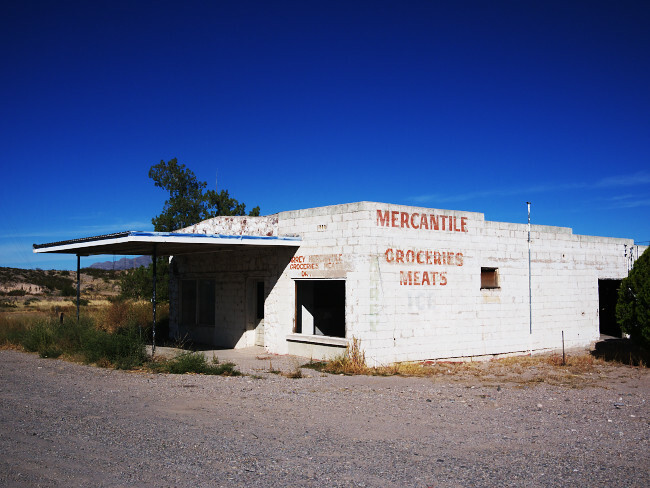 We take a turnoff down a side road, and stop in at a roadside market, to purchase some produce. 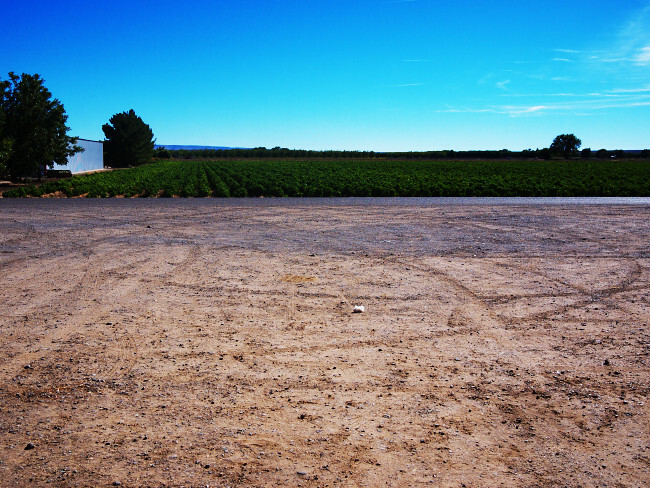 We buy fresh green chiles, bags of red chile powder (both medium and hot) and bags of pinto beans and tomatoes. No one seems to be around to take our money so, after waiting a few minutes, we write ourselves a sales receipt on a spare sheet of paper and leave it, with our cash and a sizable tip for general politeness, and are on our way again. As we leave our payment under a metal can behind the counter, we notice other receipts already in place, from others just like us who found this roadside market a place of faith-based commerce. Travelling back up the two-lane highway, we stop to inspect a camel, munching dried tumbleweeds in a fenced corral, and finally stop in for an early dinner at a roadside cafe. Family run, the cafe offers us some of the best New Mexican food we've had in quite a long time. The red chile sauce is dark red, sweet and hot, and the green sauce is gentle and full of flavor. 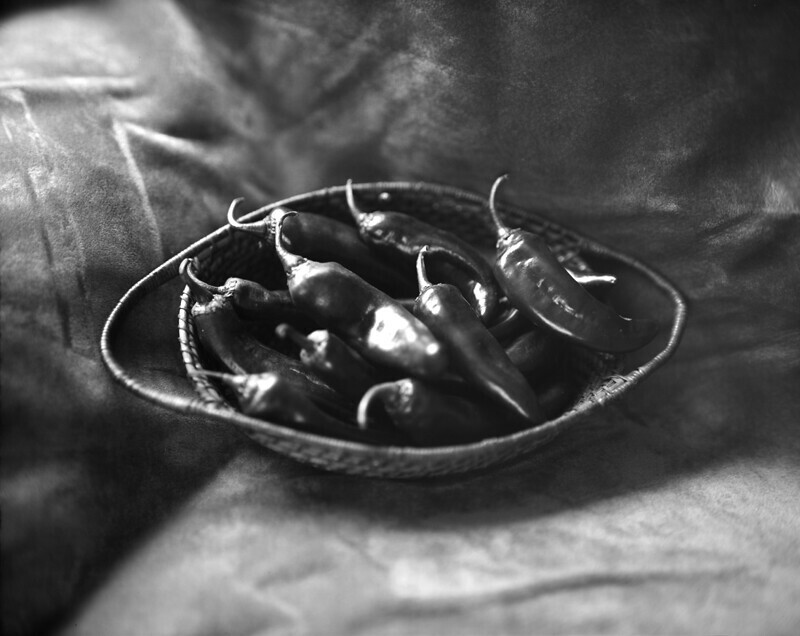 We comment that Albuquerque's selection of New Mexican restaurants seems to have dwindled in quality during the last decade; we can hardly recommend a place for out-of-towners to try, they all seem so mediocre. But not down here, in the heart of New Mexico's chile-growing region, where good food, at modest prices, seems to be the norm. We soon say our goodbyes and are once again on the road, quiet in our introspection, watching the sun setting on the distant mountains, the hills glazed in an otherworldly light that seems impossible to capture in-camera, more like the light of a distant dream from which we've yet to fully awaken from. It is dark when we arrive home, but our hearts are enlivened by our afternoon's time on the road into the heart of chile country. It may come as some surprise to hear me admit it, but we've finally entered the Era of Good Enough. I'm talking, of course, about some of the new photographic technologies now available, micro-four-thirds cameras and print-on-demand publishing, to be specific. They're good enough, now, to satisfy one's technical needs as a photographer; good enough to permit taking images derived from such devices and publishing them via the "vanity press" of print-on-demand, the internet-based publishing house for the 21st century; good enough that any person with the requisite talent and desire can express their photographic voice unhindered by what used to be the intrinsic limitations of a closed publishing world. It was but a few years ago when a person of some creative bent could only fantasize about being "published," having a book of their images adorning their (or someone else's) coffee table. One had to break into the publishing business as a recognized author and photographer in order for that to happen. Or, go through the lengthy and uncertain apprenticeship of the traditional darkroom aficionado, learning the dark chemical crafts of printing to gelatin silver, perhaps also earning a degree in fine art, and hoping one's skill and vision were worthy of notice by a discriminating audience as they marketed their reputation as "artist." Now, all of that has dramatically and suddenly changed. Print-on-demand publishing has become a valid alternative to the cottage industries of computer or darkroom-derived printing of fine art photographs. Instead of printing photographs via a small-scale piecework process, large industrial-scale commercial printing technology has been combined with the convenience of a user-friendly website to bring commercial-quality printing to the masses. Whether this new found access to the unlimited world of commercial printing technology makes an "artist" of the common man is another question entirely; neither does access to these new methods by the masses obviate the importance of, or need for, an educated art elite. But it is now an established fact that trained and educated professionals can and are now taking advantage of these new methods alongside the enthusiast amateurs, whose cost of access is so ridiculously low that virtually anyone can afford to "pay to play." Not only is printing technology changing, but now we are seeing a sea-change in camera technology itself. New camera formats, like the micro-four-thirds, offered by both Panasonic and Olympus, promise "good enough" image quality, with the convenience of high-quality interchangeable lenses, obviating the need for the high-end gear of the paid professional, in a package much smaller, lighter and less expensive. To be sure, the paid and equipped professional photographer will still be called upon to ply their necessary trade; but for many of the rest of us, who otherwise have the creative intent and desire, but lack the resources, the new tools of photography are a heaven-sent blessing. If one were called upon to create mural-sized fine art prints, a professional-grade DSLR and printing setup, along with the skill and experience required to squeeze out the last drop of quality, would be required. But for coffee table books printed via the commercial CMYK offset press method (like what you would find in any bookstore's photography section), cameras like the micro-four-thirds are plenty sufficient, given the understanding that skill, experience and vision are still absolutely necessary ingredients to the successful photographer. 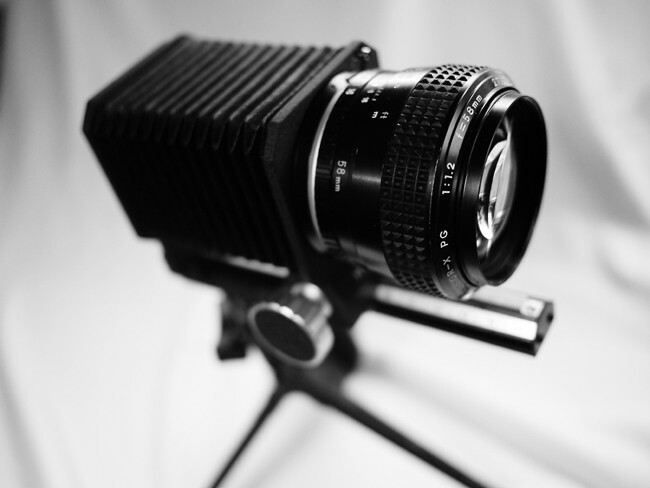 The thesis of my argument isn't based on mere speculation or uninformed opinion, for I have personally witnessed the power of these new photographic tools to offer fresh possibilities for the presentation, marketing and dissemination of one's work. 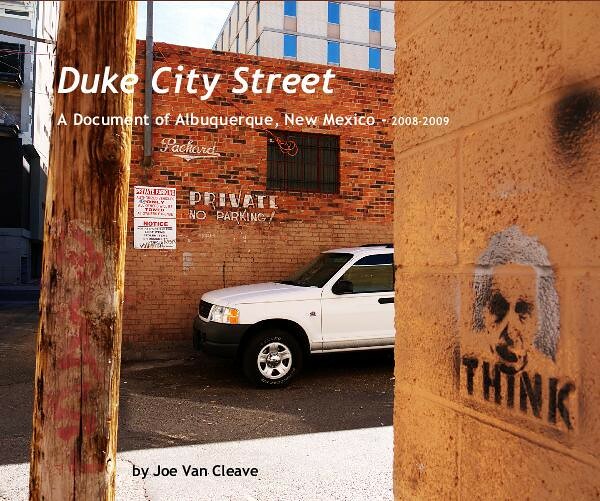 My first book, "Duke City Street," has been published via Blurb, the well known online print-on-demand press. I was worried, between the time I had uploaded and ordered a trial copy of the book and when I received it in the mail, that there would be some fundamental flaw in the concept, like the paper or bookbinding quality would be inadequate, or the image quality would suffer in the translation process from my computer screen to some unknown printing press in who-knows-where. But my fears were easily put aside when the book arrived. I was more than pleasantly surprised at the quality, rather more like overwhelmed. It's not that I'm some master at Photoshopping image files, but that my adequate skill and vision at crafting images that look great on my computer screen translated with near effortless ease onto paper, a collaboration between my existing photographic skills and the ease of the new technology to create an end product more than adequate for the purpose. The new photography technology is good enough. I'm obviously not the only one who feels this way; just look at the online pages of Blurb, or any of the numerous other print-on-demand publishers, for example. Wedding photographers by the church-full are abandoning the piecework of finagling high-quality wedding portraits from inkjet printers, and instead are having high quality wedding books commercially produced via print-on-demand. I have a personal friend whose spouse is a wedding photographer, who used to spend hours and hours fine tuning her image files so that she could output adequate inkjet prints for her clients, but not so any more. Now, she creates and uploads a wedding book, which the wedding party, family and friends can preview online and order as many copies as they desire. Photography and mass reproduction printing are two distinct and different crafts, requiring skill and experience at sometimes considerable financial cost, that only comes from dedication to either the one or the other; that is the new reality in the 21st century. We are entering an era of specialization, when the paradigm of the do-everything home computer is inadequate for our new demands and standards. 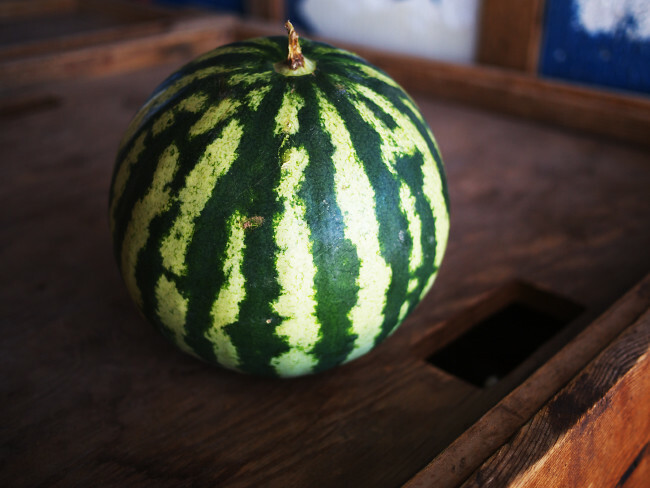 Witness the new trend toward "cloud computing," the farming out to remote server farms the storage needs and computing power we used to keep in-house. Now, self-publishing is heading to the Cloud, too. My thinking along these lines goes like this: why should a person have to wear the two hats of both printer and photographer? In the heyday of film photography, many professionals left it up to their dedicated custom photo labs to do the bulk of their printing. And it has been recognized time and again that the skills required of the adept darkroom craftsman are not necessarily the skills of the photographic craftsman. Very few widely recognized fashion and documentary photographers, for example, did their own printing, except by absolute necessity. They employed their own skilled and dedicated printers, with whom they collaborated to produce their finished work. I have come to recognize the period of the last decade as a transitional one, when the high-quality custom photo labs that we once took for granted in the past had by and large went by the wayside, and many small-time photographers (those who weren't blessed by the resources of an ad agency, publishing house or news organization) had to learn to print for themselves, adapting computerized printing technologies and methods that weren't originally designed or optimized for the job, in a piecemeal fashion. That era, it would seem, is finally coming to a close. Print-on-demand is better than ever, more affordable than ever, it would seem, due to competition and the continued demand of a high-quality product at a reasonable price. There are those who will continue to pursue the fine art inkjet print, just as there are those who will continue to pursue the fine art gelatin silver print. But for many of the rest of us, who recognize that our limited resources and talents are best spent as photographers, rather than makeshift printers, we live in a Golden Age when we can self-publish our photographic work with a quality every bit as good as any other commercially-printed medium. Along with this renaissance in printing and publishing, the new camera technology is also changing how photographers compose and capture their work. This became evident to me recently as I was sifting through the bulk of my image files during the creation of my first book: my Lumix G1 camera had changed the way in which I composed and created photographs. I began to notice that many of my stronger images were composed with the purposeful intent of manipulating the depth-of-focus as a creative tool. This is nothing new, of course; as long as there have been adjustable apertures on lenses, photographers have manipulated depth-of-focus. But the electronic live-view system of the new micro-four-thirds cameras offers 100% full time depth-of-focus preview and control, something that was only of secondary concern in the optical-only viewfinder systems of the older camera technologies like SLRs and rangefinders, whose depth-of-field preview was either limited under dim lighting, or impossible. Full-time control of depth-of-focus as a creative tool, every bit as valid or important as are exposure and composition, is now possible in the hands of the micro-four-thirds equipped photographer. Going forward, we will be seeing new camera formats arise to compete with micro-four-thirds, offering similar large image sensors, interchangeable lenses and electronic viewfinders in smaller, lighter packages. This is indeed a new Golden Age in photography, because we have arrived at the point where good enough is Good Enough, and instead of obsessing over the minutiae of equipment specifications - being gear-centric - the photographer can once again return to what should have been his primary focus all along, that of the creative art of image-making. We surround ourselves with the detritus of our lives and culture, like the byproducts of those that have gone before us. Sometimes these byproducts are amazingly high-level, cerebral, complex and abstract; things of the mind and spirit, things that are bigger than ourselves. We are appreciative, humbled even. But often, in the solitude of our individual lives, it is the little objects, like humble servants, that we surround ourselves with that mean so much. I know, this sounds shallow, somewhat, as if people, and allegiance to principles, should matter first and foremost. But it is by these simple implements that we make do, that help us get by, each and every day, that take little or no credit or appreciation, yet in which we take such simple pleasure; joy, even. 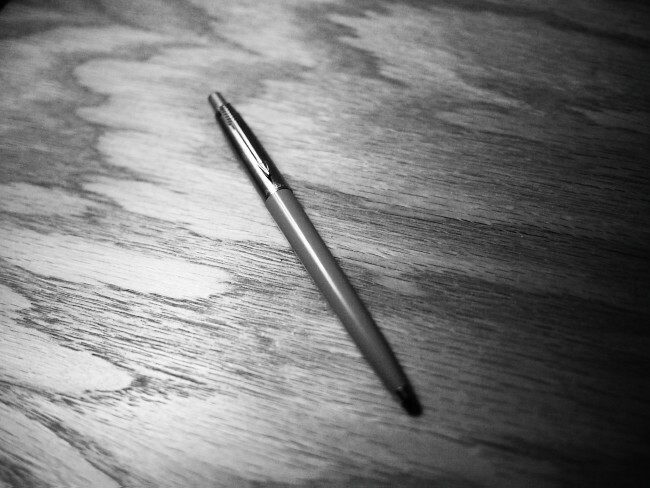 So I paused, today, to consider some of these few simple objects, just a few of my favorite things. We start with this Citizen Eco-Drive, solar powered analog watch. 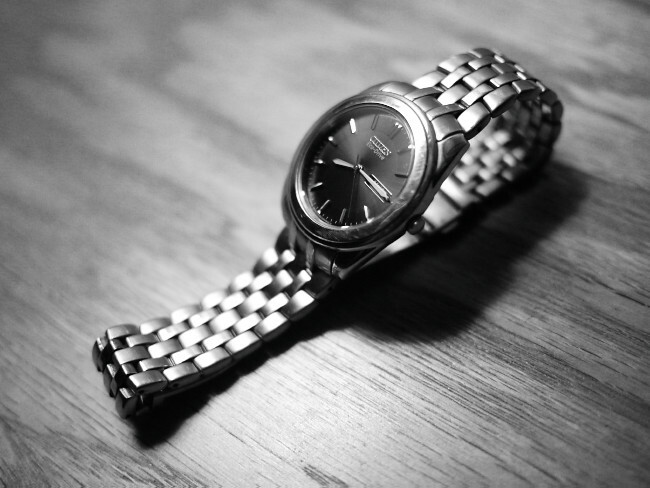 I haven't worn watches of any kind for years, being regularly equipped with a cell phone or nearby a screen of some kind that announces the time, incessantly, as if to remind me that, while at work or play, I must keep track of the passage of each moment, like it's my civic (or higher) duty. But off work, on my own time, when I try not to pay too much attention to screens and phones and whatnot, I like the company of this humble time-keeping device. Lacking disposable batteries (its internal battery is kept charged via a solar panel on its dial) it's always reliable, and looks elegantly mechanical; timeless, even. A close friend of mine had owned this HP-21 calculator for decades, starting back sometime in the late 1970s, while in school. He finally "upgraded" to one of those fancy graphing calculators, accompanied by instruction manuals much larger than the calculator itself, and so handed this off to me. Its internal battery was dead, and of a design not originally designed to be fixed (you had to purchase a new battery pack from HP, which are no longer being manufactured). So, I took the plastic battery pack apart and replaced the two AA-sized NiCad batteries, restoring the red-LED displayed calculator to new life. It uses the RPN (Reverse Polish Notation) method of number entry, which I enjoy using. It's no fancy graphing computer, but it still crunches numbers reliably. I don't use this Scripto mechanical pencil for writing; in fact, I haven't had it for very long. But the reason it's one of my favorites (I prefer Pentel 0.7mm mechanical pencils, thank you very much) is because this translucent, plastic-barreled pencil was the very same kind my Grandmother used to work her crossword puzzles with. I can still picture the bright, New Mexico afternoon sun, streaming in through her lace curtains, illuminating as if from inside the plastic barrel of her pencil, and the way the pencilled letters would almost, but not quite, scratch through the flimsy newsprinted puzzle, and the hard, smudgy eraser markings left after an errant puzzle entry. This one's a momento from childhood, but still a favorite. 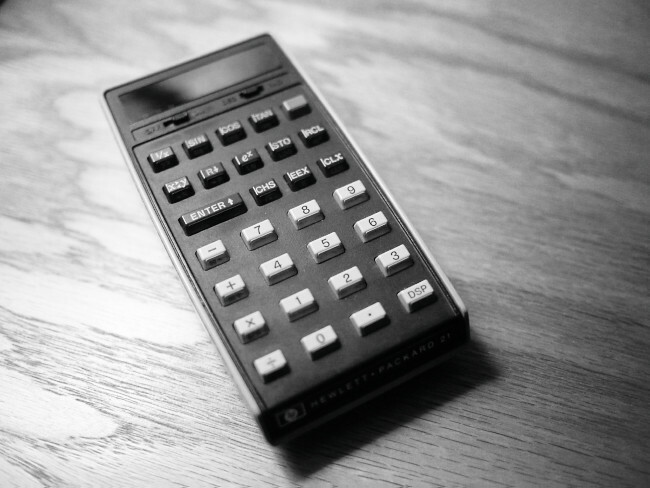 I bought my very own HP-11C scientific calculator in the mid-1980s, which I've used extensively, and have only had to replace the batteries once. 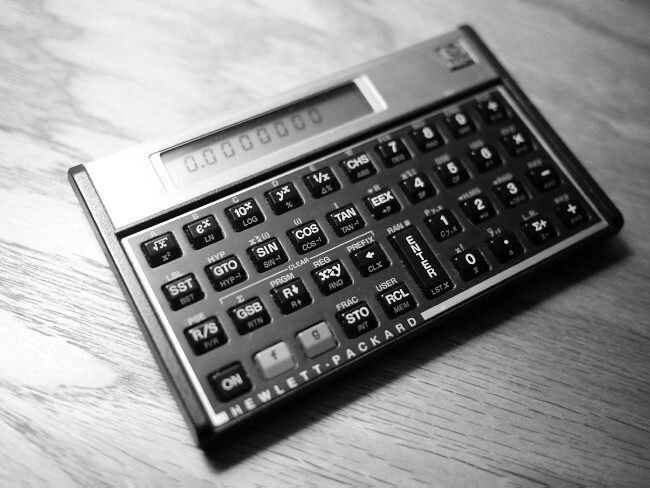 I was once told by an engineer that the keys on the HP calculators were designed to "last a lifetime." I'm not sure about that, but they are every bit as good, after more than 25 years of use, as they were when new. 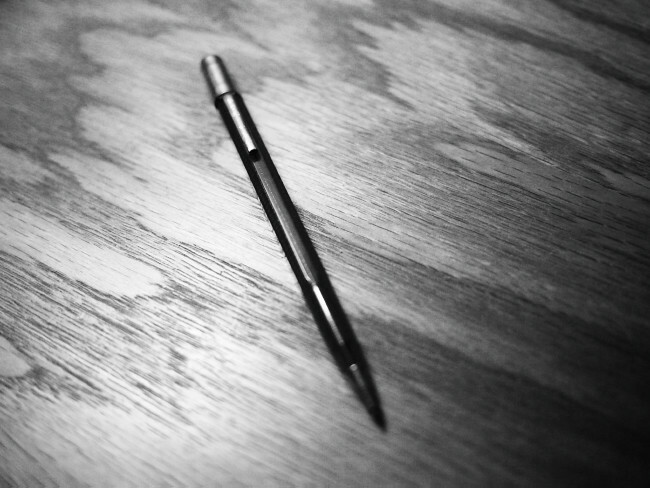 Parker ballpoint pen. 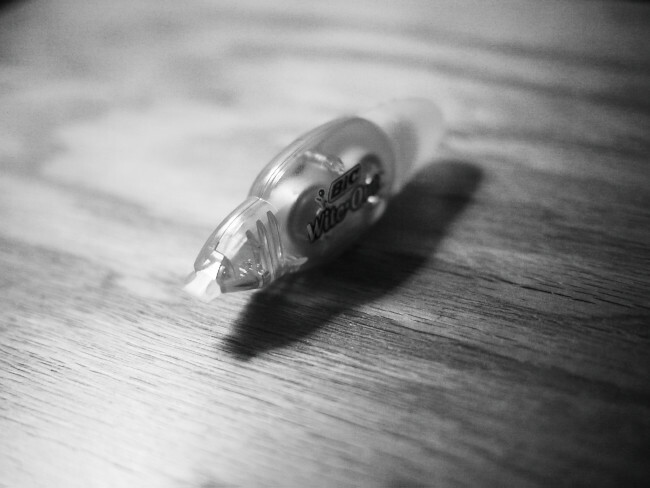 A great ballpoint cartridge (smooth writing, tons of ink) in a simple metal and plastic housing that's ultra-reliable. My Dad always used one of these, carried it in his shirt pocket. I can still see his carefully printed letters and numbers as he wrote out checks and balanced his checkbook. Lots of memories here, in a very practical and elegantly styled package. 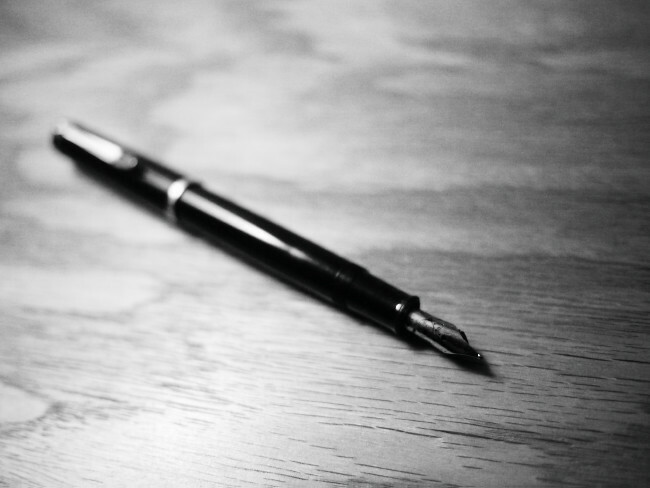 I don't often do lots of writing with ballpoints, but when I do, I reach for the Parker. When my personal writing style gravitated toward mechanical pencils and fountain pens, I needed something to carry them in. 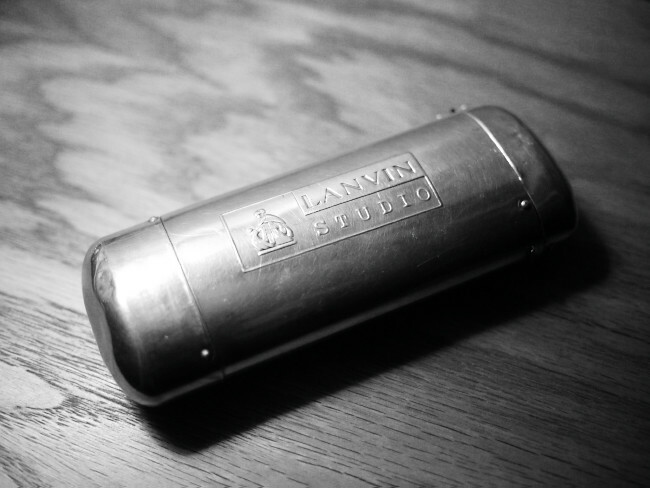 Wandering through a favorite thrift shop, I happened across this Lanvin Studio eyeglass case, made from aluminum and felt-lined, which serves the purpose admirably. I've owned a few fountain pens over the years, back before the internet when I knew little about their finer points (ahem), and was more in love with the idea of fountain pens than the way that the particular ones I owned actually wrote. Then I discovered the Pelikan piston-refilled pens, which dispensed with cartridges and instead are directly filled from bottled ink. Talk about nice, smooth writing, and the convenience of bottled ink means you never run out, as long as the bottle is near (which I carry in my writer's bag). Really, the piston itself holds about twice what a Cross cartridge contains, so it's pretty good, even without the bottle. I know, there are those bottled ink fans who mix their own colors; I'm not that into it (yet), but do appreciate the way that one can customize one's writing experience, something you just can't do with ballpoints, rollerballs, gell pens and mechanical pencils. I've owned this Franklin electronic bible for several decades. It has the dictionary module plugged in the back, meaning it also serves up definitions, spelling suggestions and synonyms, besides spiritual riches. It's small and light enough (and the batteries have lasted for decades) that it always accompanies the other writing tools in my writer's bag. Bic "Wit-Out" correction tape. For use with my three (so far) mechanical typewriters. Indispensible. 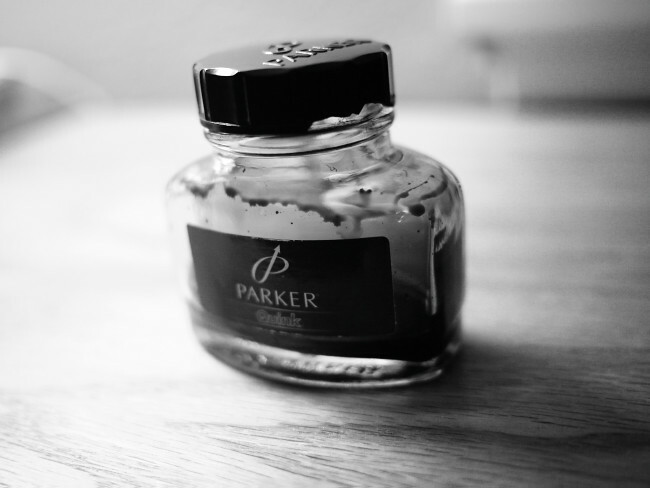 When I discovered piston-refill fountain pens, I also discovered the joys of bottled ink. I'm no ink collector; I have too many hobbies and collections as it is, I don't need another. So I chose Parker Quink blue/black ink for its reputation of quality, and blue/black color is ideal for my personal use. There's few things better than seeing a bottle of fountain pen ink almost empty, indicating a well-used pen, and many words written. Except another, fresh bottle, waiting in the wings. College ruled composition books. They're harder to find (especially at common retail outlets) than wide ruled. These I found at the local university's student bookstore. I snagged a handfull. I love comp books. Good quality paper (they take Parker Quink rather nicely) in a good binding. The thing is, you just don't scribble and tear out sheets, like with natty spiral notebooks. 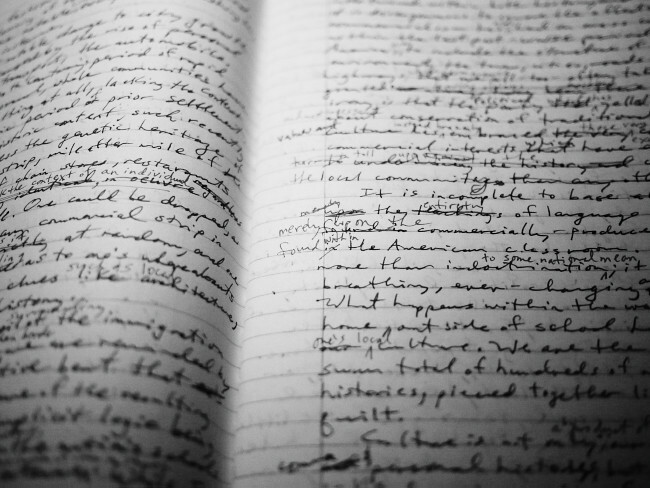 Composition books are intended to stay whole, every page, paragraph, sentence and word is permanent. Put the filled ones up in your bookshelf, as an archive for years later. There's lots of stylish journal books these days from which to choose from, but for my money nothing beats a college-ruled comp book. 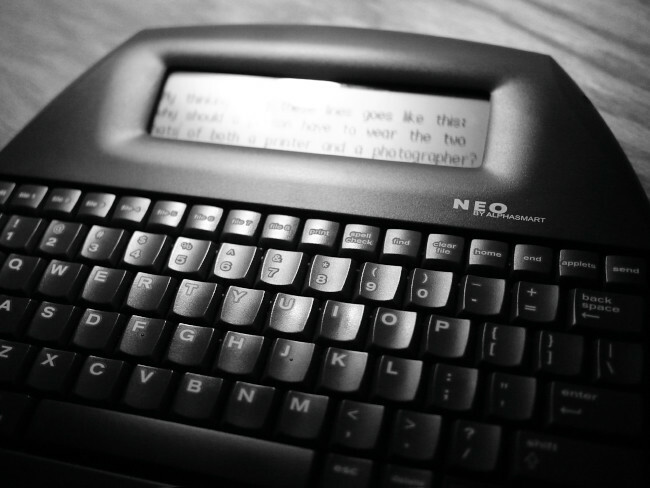 AlphaSmart Neo. 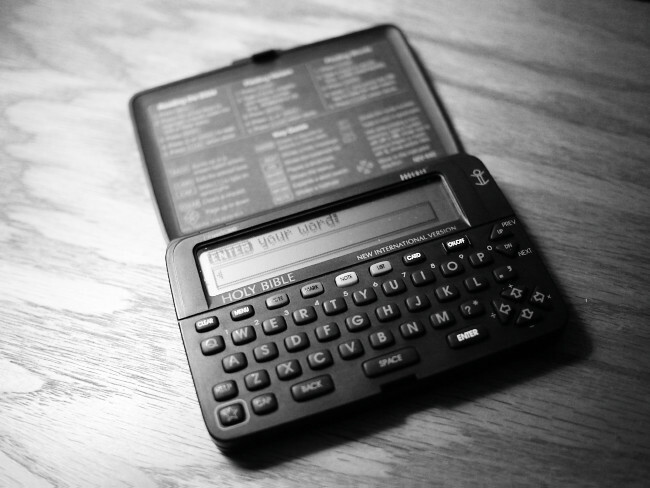 A word processor in firmware, inside a great keyboard. Four (or six) line LCD display. Enough memory to write a book (literally). Three AA batteries last for several years (about 700 hours) of use. Syncs up to your PC. Will substitute for your PC's keyboard. Each letter, as it's typed, is already saved. Did I mention it's one of the best feeling keyboards you'll ever use? 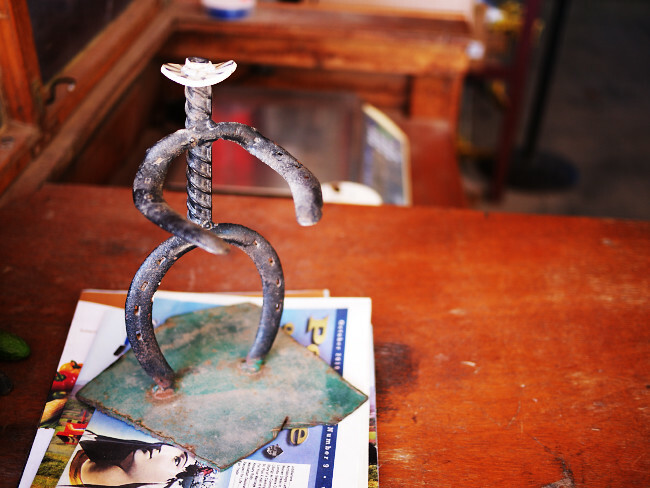 Available from Rennaissance Learning for about $160. 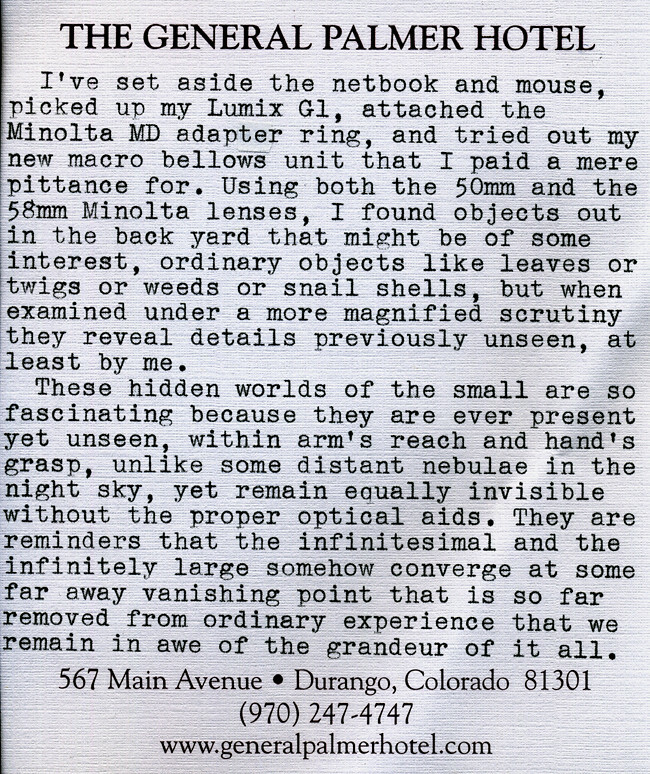 This is like the best of typewriter technology, mixed with the best of computer technology. It doesn't surf the internet or do email or play games or anything else but write. Sadly, it's somewhat taken me away from my fountain pens, composition books and manual typewriters. Yes, it's that good. 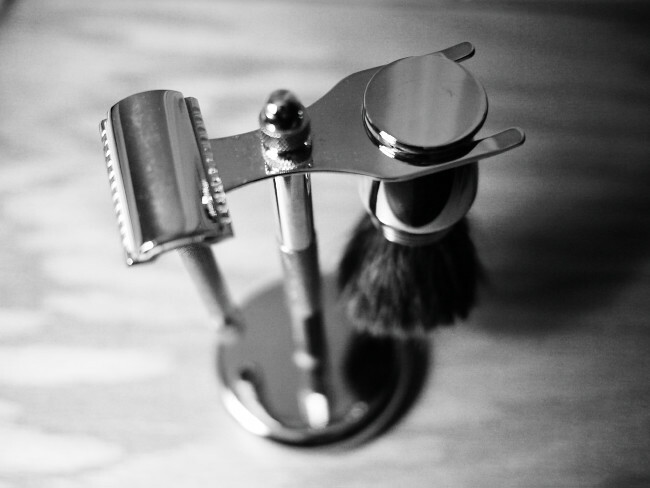 Merkur shaving kit. For when the whiskers get a bit shaggy. Elegant yet durable metal construction, single-edged, double-sided, platinum-coated, German-made blades that are so thin they flex like paper. Sharp. Did I mention sharp? The cleanest shave I've ever had, short of a straight razor. Forget your four or six-bladed cartridge monstrosities, this is the real deal. 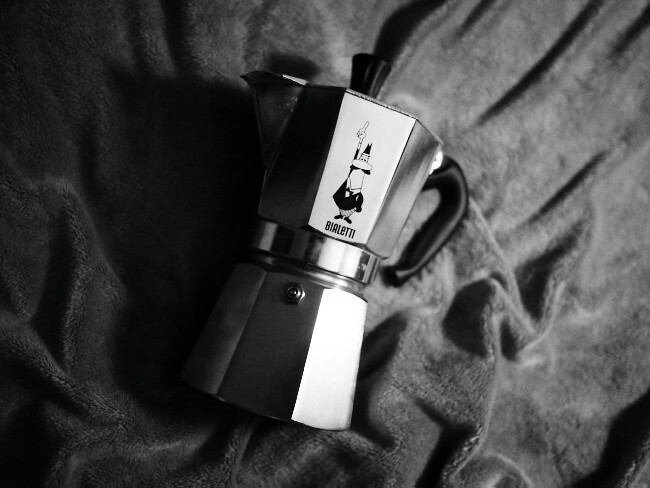 Bialetti stovetop espresso maker. Steam powered coffee. Think steampunk meets the espresso generation. Three simple parts, makes great espresso, genuine Italian. I remember the first time I used it, one recent summer morning. My wife, walking back from the gym, rounded the corner from the sidewalk into our driveway, and could already smell the espresso from outside. Elegant simplicity personified. It's nice to brew up a pot prior to sitting down to write. My new Starship to the hidden world of Inner Space, a Minolta MD macro extension bellows, used via a Minolta MD - to - Micro-Four-Thirds adapter ring onto a Lumix G1 camera. 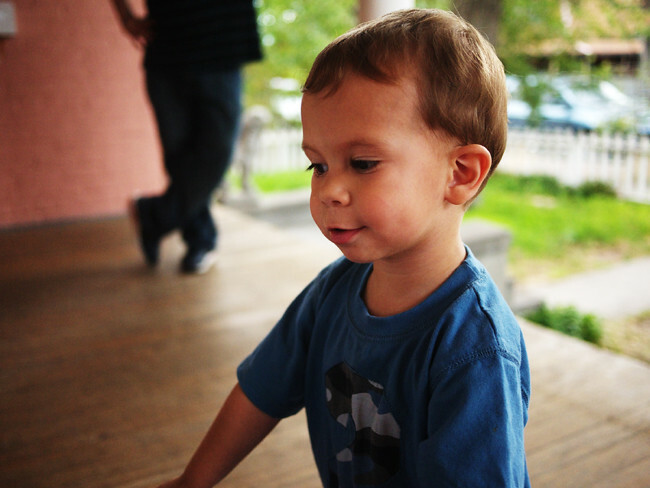 Shown with 58mm - F/1.2 Rokkor-X lens mounted. What we call "milk weed," a common yard pest, I would not have guessed possesses such minute but beautiful flowers. 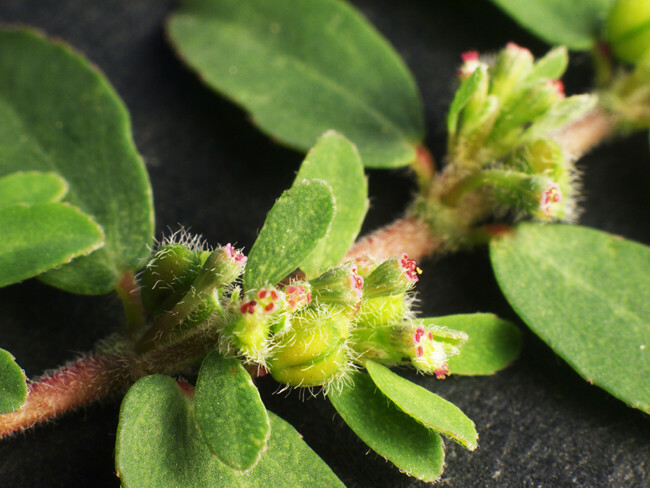 What small insects must inhabit these flora in order to pollinate such tiny buds. 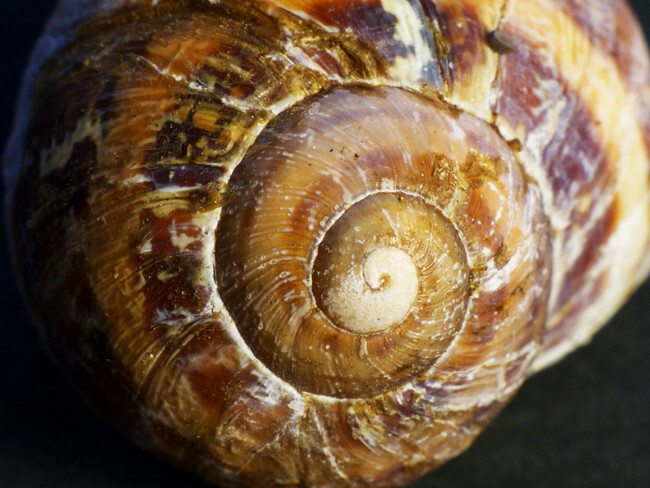 A humble, abandoned snail shell displays such interesting color and form when examined under the scrutiny of the Starship to Inner Space. 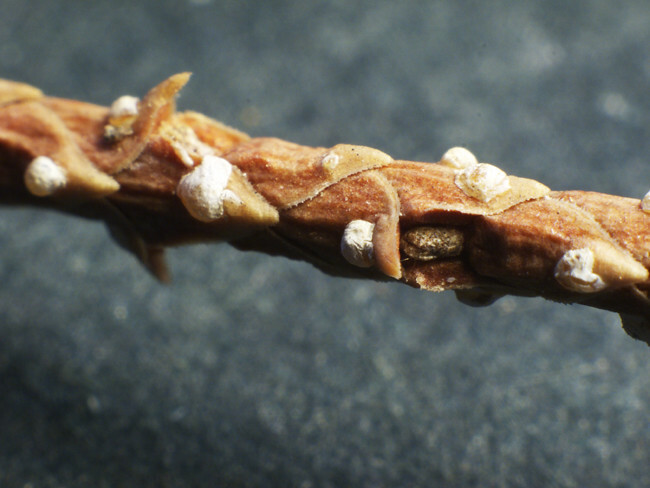 These tiny twigs fall in droves from our cedar trees, covering the landscape, and appear like pieces of All-Bran cereal to the unaided eye. But under closer scrutiny they reveal a new world of interesting detail. 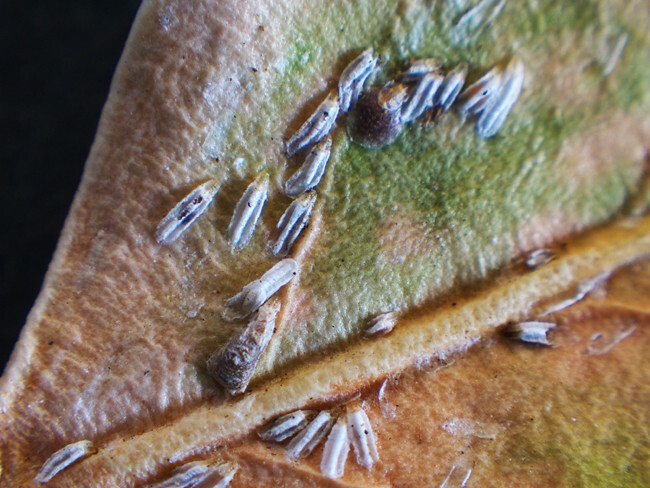 Our evergreen shrubs are blighted by what we call "scale" every year; much to my surprise these tiny white specks, upon closer examination, appear to be insect larvae, insinuating a new course of action next spring.